Arena Ready was in full force on Sunday at the 2015 Strong As A Bear Team Competition in San Rafael at Tamalpais CrossFit. We had five total athletes on two teams - Coaches Sarah, Rob, Jon (Inferno), and Lindsay (Sparkle) formed "Team Hoplite" which competed in the co-ed division, and Kim banded together with three of her friends and fellow competitors from three different affiliates to form team "Four Muscle-teers" which competed in the all female division. Our Arena Ready athletes who competed on Sunday. 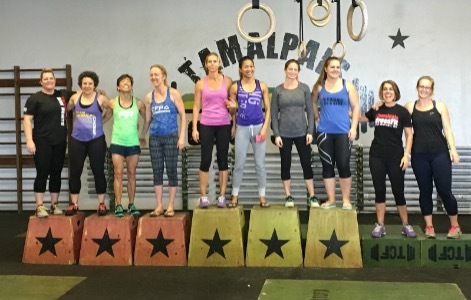 It was a fun day of competition and deceptively taxing WODs, and the good folks at Tamalpais CrossFit did a fantastic job running a great event. 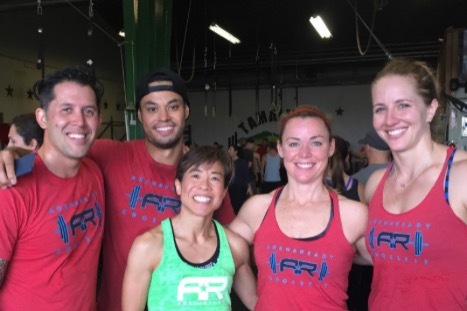 Kim and her teammates Sally (from NorCal CrossFit), Hildy (from CrossFit Palo Alto), and Pam (from CrossFit San Benito) fought their way to a 2nd Place overall finish, exhibiting strong teamwork by showcasing their strengths together. The "Four Muscle-teers" on the podium (left). 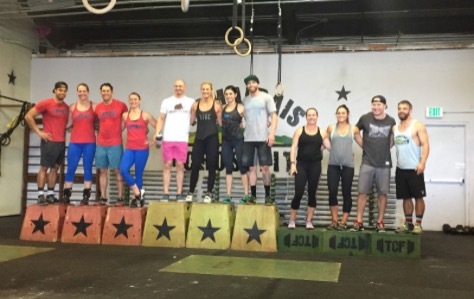 Our team of AR coaches battled closely with the top three teams in the co-ed division in each of the 5 WODs, and in the end they did our gym proud by also finishing on the podium in 2nd Place overall. It was also fun to see two married couples work so well together on strategy and teamwork, leaving the competition floor stronger together (albeit a bit sore and jello-legged). "Team Hoplites" sporting the signature Arena Ready RED & BLUE on the podium. Nice work teams, and way to bring home some podium finishes! It's always great to see the CrossFit community come together at these competitions, and Arena Ready is so grateful to be a part of such a cool/fit/welcoming/encouraging/inspiring circle of like-minded people. Kim's four-affiliate team of strong women was the epitome of what this stuff is all about! If possible, add to your loading from 10-28-15.